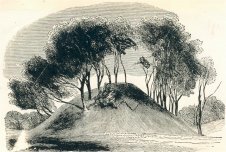 The oldest evidence of habitation in the area is to be found in the ground of Mount Temple near the railway line, where a cone shaped mound or tumulus exists. This burial mound is one of three in the general area, which testify to the presence here in the early Bronze Age of an ancient tribe that lived in the area. One theory suggests, that they were erected by the followers of Partholan, who perished of a plague and were buried around the plains of Dublin. The earliest recorded name for Donnycarney was Duncarnac, found in the Register of All Hallows (1172), which suggests a pre-Christian settlement in the area with fortifications protecting the Slí	Cualann, one of the ancient roadways from Tara. Donnycarney or more precisely Domnach Cearnach, the name in Irish, is a derivative from several sources with attending variations and interpretations. Liam S. Gogan, keeper of the Art and Industrial division of the National Museum and one of the leading Celtic scholars in the early 1930's, gave one interesting interpretation of the name. He was of the opinion that a shrine to the Gaulish horned god Cernunnos (an ancient Celtic deity) was located in Donnycarney. The Gaileanga, who were mercenaries from Gaul and used by the kings of Tara, settled in the north Dublin area and the Coolock Barony and also in various other areas in Ireland before the coming of St. Patrick. The discovery of archaeological objects on the north Dublin island of Lambay in 1927, including Roman type brooches and others with Germanic elements, may indicate occupation at some stage. It is also recorded that the Gaileanga once occupied the land around Glasnevin, where St. Mobhi built his monastery. Mr. Gogan wrote - " they (the Gaileanga) were probably recruited in Boulogne Sur Mer and brought with them their native Gaulish god Cernunnos -------. His shrine was at the residential area of Donnycarney and when Christianity was brought to the people, a dominicum or church was built there, whence its name in Irish Domnach Cearnach. This spot doubtless marks their assembly ground and the residence of their king". The name recorded in the 12th century for the area was "Duncarnac" and the Irish for Dun is a fort, which would indicate an earlier fortification occupied by a group like the Gaileanga, protecting the Slí Cualann. The Gaileanga were a people of considerable power and were famous as warriors and renowned for their prowess of spear vaulting over walls during attacks on native forts. When the Normans settled in Malahide and Balgriffen in the 12th century, they would have been surprised to discover the area was already provided with a fine highway, the Slighe Cualann, one of the five historic roads from Tara. Though historians differ as to the precise route it took, it is believed that the Slighe Cualann ran through Garristown, Mullaghoo, Hollywood, Feltrim, Artane, and Donnycarney on its way to Cualann (south of the Liffey) and the hills beyond. In the year 794, the first powerful Viking attack in Irish waters occurred on Lambay Island and other smaller islands around Dublin, which were devastated. By the beginning of the 11th century they held control of Dublin and all of Fingal (north County Dublin). On Good Friday April 23rd 1014, Brian Boru and his Dalcassian army laid waste Fingal and advanced to meet the Norsemen (Dubhgall) and their Leinster allies over the plains of Clontarf. Fierce fighting took place across the Lands of Donnycarney and in an area called "The Bloody Fields"(most of present day Marino), the Dal Cais warriors defeated the Vikings. Brian Boru took no part in the battle and spent his day in prayer in his tent in nearby Tomars Wood (top of Castle Avenue). Brodhar the Viking killed Brian in his tent. After the battle, the victorious Dalcassians mourned their dead king and brought his body to the monastery in Swords. It is possible the procession took the ancient road from Clontarf via Killester Lane to Malahide Road and onto to Swords. Between 1166 and 1172 Dermot Mc Murragh, King of Leinster granted title of the Lands of Donnycarney and Clonturk (or Kanturk, as it was then known) to the Augustinian Monks of All Hallows (now Trinity College). One of the earliest documents relating to Donnycarney is the Registry of All Hallows, in which an entry dated 1220, refers to one John Latimer, a Norman, who gave a parcel of land near Schikeloth called Inchenhaven to the Canons of All Hallows. The Inchenhaven (inse na habhann, riverside meadow) was the ground beside the river and was submerged in times of flood and is today covered by Collins Avenue East and the Church grounds. The Schikeloth mentioned is the Latin word for Silloge, the ancient name for the Donnycarney River. In 1755, when Lord Charlemont returned from his continental travels, his stepfather Thomas Adderly presented him with a country villa, Marino House and the Lands of Donnycarney. The young fell in love with the place, which he called Marino. His famous Casino was completed in 1771 and cost £60,000. The design is Sicilian Doric and ranks very high among European examples of it's kind and is the crowning glory of the area. The Casino was connected with Marino House by means of underground passages, through which food and drink was conveyed, when the earl entertained his guests. During the War of Independence, Michael Collins used the underground passages for rifle and small arms practice. Now a comprehensive school and the Alma Mater of the U2 band, has a plaque dated 1862. Henry Colley come to live here in 1880, his grand daughter Elizabeth Bowen, the distinguished Irish writer, was a regular visitor during her childhood. The last resident was Picton Bradshaw. Hence in recent years, most persons in Donnycarney/Marino area knew the estate only as 'Bradshaws'. This was the second house of the name, and was built by Robert Carroll, the proprietor of the quarries, in 1781. Alex Thom the well-known publisher and printer came to reside here in 1853 and it is believed that Thom employed John Skipton Mulvaney, the renowned Victorian architect to remodel the house. The golf club founded in 1912, took up residence in 1921. It was often said that Dracula had a stake in Donnycarney. The creator of Dracula, Bram Stoker, although born in the Cresent in Fairview, spent most of his childhood in Artane Lodge, a villa residence off Collins Avenue/Collins Park. In 1888 Tim Harrington MP and three times Lord Mayor of Dublin and secretary to Parnell and the Land League came to reside in Artane Lodge.